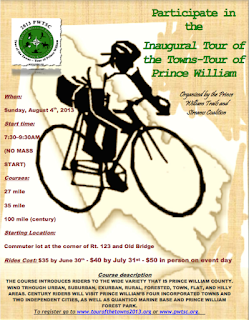 Join us for the the Prince William Trails and Streams Coalition's inaugural Tour of the Towns -- Tour of Prince William Century Ride! Enjoy a choice of round-trip routes (27 mile, 35 mile, and 100 mile) that will introduce you to the wide variety that is Prince William County. Wind through urban, suburban, exurban, rural, forested, town, flat, and hilly areas. Century riders will visit Prince William's four incorporated towns and two independent cities, as well as the Quantico Marine Base and Prince William Forest Park. Event Details: The ride will be held on Sunday, August 4, 2013, near the town of Occoquan, Virginia, approximately 20 miles south of Washington, DC, immediately off of I-95 exit 160. There are three routes of 27, 35, and 100 miles on public roads and multi-use trails. This event is open to the public and all cycling enthusiasts are invited to attend. Net proceeds benefit the Prince William Trails and Streams Coalition, a 501(c)(3) organization dedicated to improving trails and blueways access points. Shouldn't there be a Tour of Fairfax? While there are many charity rides, club rides, and a few races like the Tour de Tysons, we think there should be a tour of our fair county. FABB has discussed the idea but our resources are limited. The Tour de Lee was formerly sponsored by the Lee District but it was discontinued a few years ago due to lack of volunteer help. The Reston Century is a very popular recreational ride but the course is mostly in Loudoun County.